The Combo units offer a little of everything. 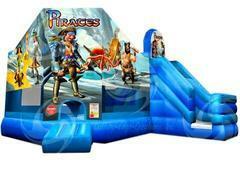 Jump, Climb and Slide! 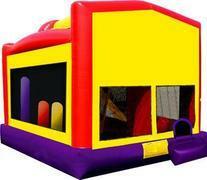 Complete with a jump area, basketball hoop, Obstacles and a slide. 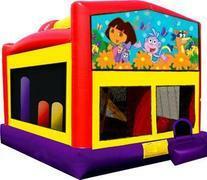 Rent the official Dora the Explorer Combo, accept no imitations. 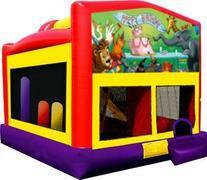 Bounce with Dora, Boots the Monkey, Swiper the Fox, Dora's purple Backpack, and Map. 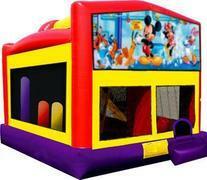 The Power Rangers moonwalk is a very popular rental amongst boys. 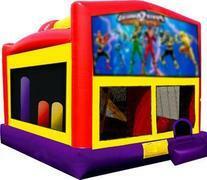 The inflatable moonwalk graphics feature all your favorite power ranger colors. Warm up with some jumps and some slam dunks, outmaneuver 5 obstacles, climb to the top, slide down and do it all over again! pic a banner to go along with your party theme or just rent it plain! Who lives in a pineapple under the sea? Spongebob Square Pants! Don't settle for "sponge boy", "sponge dude", or "the sponge bounce". 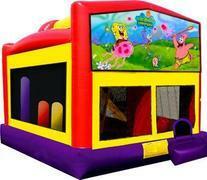 This is a real Sponge Bob bouncer featuring Patrick, Squidworth, and the whole gang from the Nickelodeon cartoon. Enjoy an adventure with your group of Pirates! 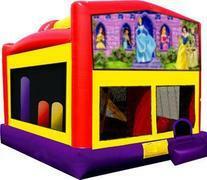 Enjoy a Princess adventure with your little One!